¿Pretérito perfecto or Pretérito indefinido? One of the most frequent questions I hear is…when to use Pretérito perfecto compuesto -present perfect or preterite perfect in English- and Pretérito indefinido –past simple or preterite in English-? I know, I know, learning past tense in Spanish is a nightmare! In the beginning, my students had many problems to understand how past tense works in Spanish and what to use in each situation. Eventually, I’ve found easy and simple ways to explain the uses and tricks to know which one is the right option in a specific moment. This post is a good start to go deep into the beautiful world of the past tense! Firstly, I will show you a couple of examples of Pretérito perfecto compuesto and Pretétiro indefinido. Yo he estudiado español esta semana —————> I have studied Spanish this week. 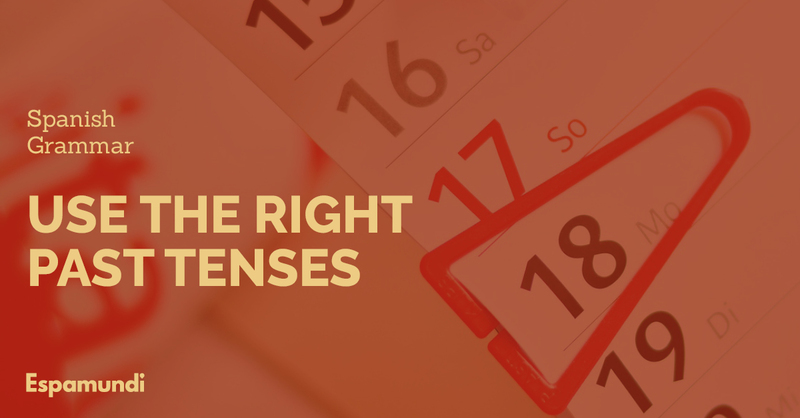 Don’t try to use English rules for past tenses in Spanish because they are not always the same. It is important to know that the word “PRETÉRITO” means “PAST”. We must be clear that all the actions have to be finished. This is applied in every single past tense. What makes the difference to use pretérito perfecto compuesto or pretérito indefinido? Well, it’s very easy!…….THE TIMELINE! 1. Pretérito perfecto compuesto: Action is finished BUT we are still in the timeline. 2. Pretérito indefinido: Action is finished and the time is finished too. Everything is gone! Hoy he desayunado a las 7 de la mañana————–>Today I have had breakfast at 7 o’clock in the morning. Explanation: The action is finished because I’m not having breakfast at this moment but the day is not finished yet, so I’m still in the same timeline, today. Other examples of time: Esta semana (this week), este mes (this month), este año (this month), este verano (this summer). Well, any period of time not completed. Ayer jugué al fútbol a las 7 de la tarde—————> I Yesterday I played football at 7 o’clock in the evening. Explanation: The action is finished and the period of time is finished, because the day was yesterday, it’s gone. Other examples of time: La semana pasada (last week), el pasado mes (last month month), el pasado año (last month), en 2009, el pasado verano (last summer). Well, any period of time totally finished.